Nestled in the heart of Millennium city, Sobha City Gurgaon is the latest residential project by Sobha Developers in Gurgaon. Home to more than half the Fortune 500 companies in the world, Gurgaon has gained prominence in the real estate map on India and witnessed a growing population migrating and settling down; owing to the plethora of employment opportunities in Gurgaon. 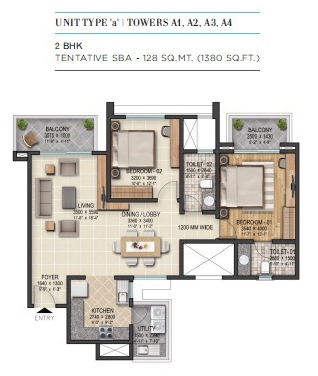 Sobha City gurgaon is conveniently located on Sector 108, Dwarka expressway in Gurgaon and is well connected to other important parts of NCR. The project is spread over a massive 38 acres and offers 2 and 3 BHK high end luxury flats with world class amenities. Sobha City gurgaon Location Advantages: Located strategically in sector 108 on Dwarka Expressway Gurgaon, it is one of the most awaited residential projects in Gurgaon. • Proximity to the commercial hub of Gurgaon. • Within 15 minutes from Indira Gandhi International Airport. • 3 km from Dwarka, Asia’s largest residential suburb with a total population of 1.1 million. • Less than 30 mins to reach Cyber city via Palam Vihar, Old Gurgaon. • Adjacent to the most developed sector 109 on upper Dwarka expressway where almost 13000 residential units are supposed to reach completion within 2 years. • Sobha City gurgaon is Situated right on the existing operational 75 metre wide road. Proximity to proposed Diplomatic Enclave in Dwarka. 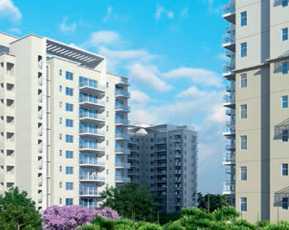 • Close to Sector 114 Gurgaon which is touted to be the most rapidly growing commercial sector. • This Property in Gurgaon is Spread over a massive 39 acres, it is the largest single group housing project in Gurgaon today. • Sobha City gurgaon is spreaded over 8.5 acres of natural greenery. International resort style 60 metre long swimming pool, a kid’s pool, an indoor swimming pool with an island deck over a large water body for relaxing and unwinding. 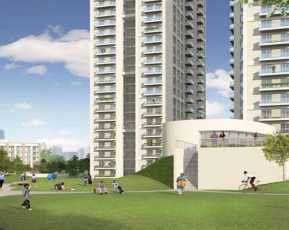 • Sobha City gurgaon has a Cricket ground with professionally prepared pitch and landscaped field. • Basket ball court, volley ball court, tennis court for the sports lovers. • Walking tacks and bike trails with no interference from traffic. • Skating rink, 2 state of the art gymnasiums. • Sobha City gurgaon has Lavish oval shaped clubhouse spread over an expanse of 40,000 sq.ft and replete with multipurpose halls, cafe, entertainment room, Squash and badminton courts, library and cards room, children’s play area etc. • Party lawns for celebrations. • Shopping and retail zone. • Premium quality vitrified tile flooring and skirting in living, dining and guest bedrooms. • Superior quality wood laminated flooring and skirting in master bedroom. • Superior quality anti-skid ceramic tiles in bathrooms and balconies. • Split Ac provision and television and telephone point provided in all bedrooms, dining and drawing room. •Sobha City gurgaon has Round the clock security surveillance through intercom. Plastic emulsion paint used in all the room walls. • High quality fittings and fixtures. • Sobha City gurgaon provides your with Covered car parking in basement and stilt level and additional guest parking space on ground level. • Large doors and windows for ample light and ventilation. • To maintain privacy, no common walls between apartments and no 2 front doors face each other. The project offers 2 and 3 bedroom luxury apartments ranging from 1381 sq ft to 2343 sq ft. There are 4 apartments on each floor of a tower. The price of the apartment that are in this Property in Dwarka expressway starts from 1.36crs and goes up to 2.44 crs. Sobha developers have offered flexible payment plans (Construction Linked Payment plan) to the prospective buyers of Sobha City gurgaon. These apartments can be booked by paying INR 500,000 at the time of booking. 10% payment to be made within 90 days of booking, and the rest payment as per CLP plan. Sobha City gurgaon, the latest project by Sobha developers is set amidst the serene backdrop of Sector 108 Gurgaon. Each apartment of this residential project is lavishly designed – spacious, contemporary modern architecture, world class amenities, 85% open space, to name a few indulgences. Located on the 75 metre wide operational road, it has direct access to Dwarka expressway which connects the major parts of the NCR. The rising property rates suggest that any real estate investment made in this area would be extremely lucrative. Backed by the brand name Sobha, a name that you can reckon with when it comes to residential investment, it comes to no surprise that Sobha City gurgaon would be an indeal investment choice for investors and buyers. About Sobha: After successfully delivering magnificent palatial hotels and luxurious villas in the Middle East for nearly 35 years, Mr. P.N.C. Menon, founder of Sobha group, forayed into the estate world in India in 1994 and revolutionised the industry by introducing premium quality construction at truly affordable prices. Today, Sobha group is a name to reckon with in the real estate scenario. Headquartered in Bangalore, Sobha is one of the most preferred real estate for residential as well as commercial properties. Sobha is bestowed by 150 prestigious awards and accolades like Arabian Indian Czar Award by Times Now, 2015 to Mr. Menon, NDTV property award, Construction India Week 2014, etc to name a few among a plethora of awards.